Wanda Group's billionaire founder Wang Jianlin said on Thursday that the company has managed to bottom out after being faced with a series of tensions and shocks in the middle of last year. The company has "reversed the situation through its own efforts," said Wang in a brief speech at the company's New Year greeting party on Thursday, the first day back to work after the weeklong Spring Festival holiday. According to Wang, the disturbances have driven Wanda to "undertake a serious and thorough adjustment of our business strategy, get rid of some burdens, and fully adopt our asset-light strategy." He also pledged that certain breakthroughs in aspects such as corporate capital will be made. In June 2017, rumors spread that the China Banking Regulatory Commission (CBRC) was investigating some of Wanda Group's overseas deals for breaching investment rules, but the company dismissed it in a statement, claiming it was only checked to prevent potential investment risks, as it is one of the major Chinese investors overseas. In July 2017, Wanda Group sold several theme parks and dozens of hotels for US$9.3 billion, which as Wang put it, could reduce his company's debt burden. Yan Yuejin, a senior researcher with E-house China R&D Institute, said he believed that Wang is planning more actions in the stock market in 2018. 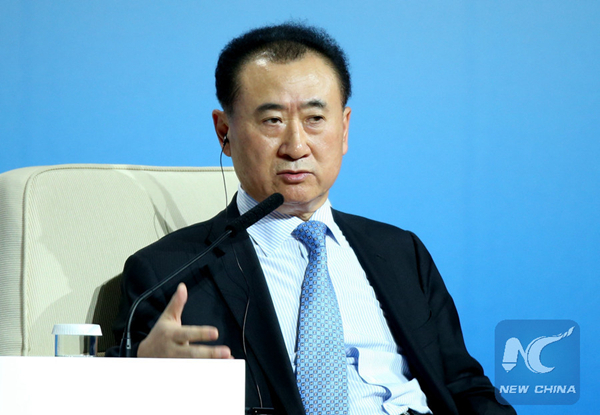 "Wanda is likely to take further actions on stock market listings," Yan said. He also predicted that the conglomerate will increase investments in commercial real estate as well as cultural and entertainment sectors. Since the beginning of 2018, Wanda has taken a series of actions to adjust its business portfolio, such as selling 12.77 percent of Wanda Film's shares to Chinese e-commerce giant Alibaba, planning a return to club ownership in the Chinese Football Association Super League and partnering with tech giant Tencent to upgrade its retail business. Following Wang's speech on Thursday, the shares of Wanda Hotel Development, a branch of the group company, jumped 11.36 percent, closing at HK$1.470 in the Hong Kong stock market. Wanda Group is one of China's biggest conglomerates, with investment in a wide variety of industries including construction, entertainment, media, industrial manufacturing, financial services, high technology, hospitality, real estate, retail, health care and sports.